Earlier this week I noticed that G0PKT was missing when I ran my occasional QRSS grabber on 30m so I asked around the QRSS community and it turned out that it hadn’t been heard for a few days. I contacted Tony, G0MBA who checked and found that the power supply which the transmitter was running from had failed. A replacement was sourced and at around 12:25z today G0PKT returned to the airwaves. I’ve captured and stitched together a few frames which show G0PKT warming up and drifting down onto the correct frequency, right at the bottom of the section of 10MHz which is used for QRSS. 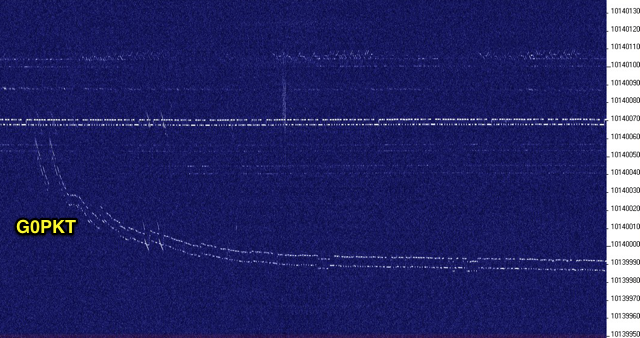 The strong trace at around 10,140.070kHz is G0MBA’s QRSS beacon. This entry was posted in Amateur radio, HF, QRSS and tagged Hans Summers, QRSS. Bookmark the permalink. I have received your qrss beacom today at 17:00 UTC 24/03/2012 signal -35,4dB from IN83jj. Congratulation for the re-starting of the beacon. G0PKT seen very strongly on 10,13999MHz, in JP20ne today for most of the morning.